The scientific program of CRICS10 has been defined. The Congress will be composed of three master conferences and seven round tables on its the thematic axes: Knowledge Management; Innovation and Digital Health; Information Management; Research and Scientific Communication; Policies, strategies and decisions informed by evidence; Open Science; and Intersectoral. The panelists are renowned experts from Ecuador, Brazil, Chile, Peru, Argentina, Colombia, USA, Canada, Switzerland, Spain and Portugal. Check out the program. The presentations will bring reflections from different global contexts, besides creating a space for learning, exchange and socialization among professionals, students and researchers interested in the field of health information and in contributing to the achievement of the 2030 Agenda Objectives. Content of high relevance and innovation will be presented through different international and sector perspectives: Libraries, Ministries of Health, Research Institutes, Librarian Federations, Universities, International Organizations and Hospitals, among others. The poster session constitutes an important space for exchanging experiences and research in the fields of scientific information and communication, knowledge management, methodologies and information technologies and its applications in the development of research, education and health systems. During the session, 140 papers from authors of 12 nationalities from Latin America and the Caribbean will be presented. 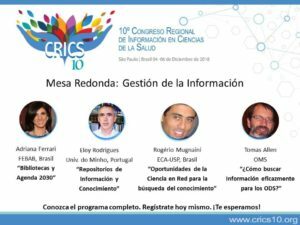 CRICS10 is an innovating forum in the field of information and knowledge management in health sciences, in tune with open science and the Objectives of the 2030 Agenda, which will take place from December 4-6, 2018, in São Paulo, at the Centro de Convenções Rebouças. See here the papers selected for presentation.